The Eva Monkey wrote: It's almost as if they enjoy tormenting us. ^ It’s almost as if we enjoy being tormented. I'd say the wait after 3.0 specifically is the one that "hurts". I don't think having such a long wait after 1.0 or 2.0 would have been the same. It's this new vision of Evangelion Anno has created I need to see continued. Seriously, so many other franchises have continued onwards, and the world has seen so many changes and the like, yet Anno and co still have yet to wrap up the extremely bitter finale of 3.0. That's what really gets me, and has made the whole thing out to be a gigantic and bitter joke to me. I seriously have no idea why you guys keep on worshiping the very grounds that Anno walks on when he has continuously and deliberately put this off for so long so he can work on other projects. It just shows that, as far as I can see, he cares very little about actually finishing the series and would rather do things that he is more passionate about. Like, if any other creator did this, they would be rightly ridiculed, but because it's Anno, he is always right and is always this completely perfect god of a creator who can do no wrong, and doubting him just makes you a salty fanboy. LightDragonman wrote: It just shows that, as far as I can see, he cares very little about actually finishing the series and would rather do things that he is more passionate about. He clearly said in interviews that the reason why it has taken this long is because he overworked and became depressed after finishing 3.0. I don't see any reason for him to lie about that nor do I see him being bored or disinterested in this film series. If he really was doing this just for the money and didn't have passion, he would have made Rebuild 1:1 remake of the original with better visuals or let someone else make 3.0+1.0 while he was on a break. Last edited by Giji Shinka on Fri Jan 25, 2019 8:02 am, edited 1 time in total. LightDragonman wrote: Seriously, so many other franchises have continued onwards, and the world has seen so many changes and the like, yet Anno and co still have yet to wrap up the extremely bitter finale of 3.0. That's what really gets me, and has made the whole thing out to be a gigantic and bitter joke to me. Because believe it or not, some of us enjoy Anno's body of work outside of Evangelion and enjoy seeing more of that too. You know, that stuff he's been busy making while not working on Evangelion? Because we understand that content creators are humans with needs too and don't exist to cater to our specific whims. Because we understand that Evangelion is first and foremost a commercial property, and always has been, that we ourselves are making the decision to go out of our way to engage with it, and that, being someone else's property and narrative, it's sometimes going going to make creative and narrative decisions that we don't agree with. Because we can separate fiction from reality and don't spin creative choices we don't like into narratives of hatred and oppression directed at us personally and don't allow made up boogeymen versions of the creator to live inside our head rent free for years on end or spend our time carrying out a campaign of drive-by passive aggressive comments and strawmen on any outlet we can find. Because we understand that Rei Ayanami is not, was not, and never will be a real girl and haven't drunk so deeply from the waifu well that we're mortally offended by the very notion that someone might not like her or *gasp* might find other characters more appealing. And because we can respect the fact Anno is willing to stick to his guns and disengage with Eva when it makes him unhappy. You would do well to consider doing the same if Eva is really making you as miserable as you claim it is and you aren't just baiting for replies. What exactly do you think you're going to accomplish here? You've been at this for years now. If Eva and Anno make you so unhappy, then stop wasting your time with them. Go find something healthier and more productive to do with your time. Nobody is forcing Eva on you but you, and like Ray and Stillborn you seem like you're only interested in repeating yourself ad nauseum and dragging others down with you than engaging in any kind of honest debate or discourse. 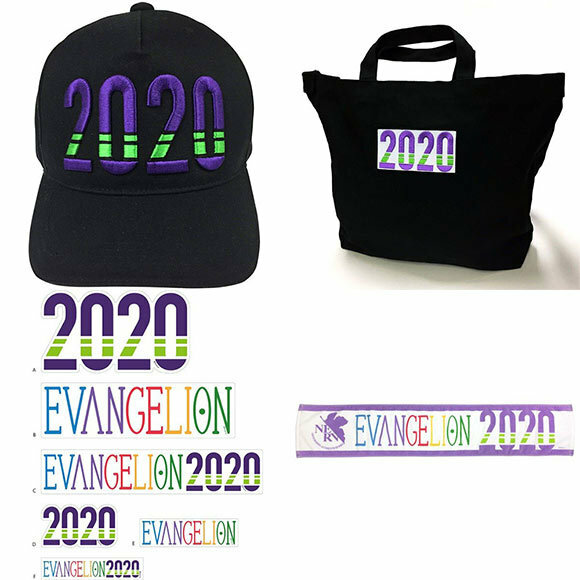 Merchandise to commemorate Shin Eva releasing in 2020 has been announced, and it's basically just a bunch a bunch of colored "2020" strapped on stuff. I admit that I wasn't calm too in my previous posts. But like LightDragonman here I can't lie to myself that none of Evas and 3.0s controversies happened, that I shouldn't be careless when I'll watch FINAL. After all I won't do the mistake to expect and want a better ending for Rebuild than how EoE was. That it ends is all I want and it should stay that way. I get it that we're all tired to repeat ourselves over the years how scared and unsure we are of what could happen. You have my word that I said enough about it and that I won't waste a bad word more when FINAL is there. Purple and green? ZOMG Unit 01 confirmed!! Good marketing tactic but I think I'd rather buy Eva merch that won't be dated in two years. I'd like to think that this is a good guarantee that the film won't get delayed, but... ugh... please just let it come out, I'm getting to old for this. Still, it seems like a very Japanese thing to make merch geared specifically around the slated release date for a thing. Toho & Toei are involved with the film now. 2020 is the release year. Anno can deliver the film he wants to make but that's something he can't not deliver on. BlueBasilisk wrote: Purple and green? ZOMG Unit 01 confirmed!! Yeah, I also think the colors are chosen on purpose. What is the "rainbow-color" in Evangelion about though? It's the Kids' first Evas? Gendo'sPapa wrote: Toho & Toei are involved with the film now. Plus they waited this long to even announce a year. I don't think they would have done that if they weren't confident they could deliver. Anyone care to translate some of the latest tweets from khara, Ogata, and the official Evangelion Twitter? One tweet suggests these photos and videos were from their New Year's celebration. Because a single tightening is a color annual event. The New Year's party hit the launch employee travel etc. Seems like a New Year's party they got together for. If I'm reading things right, Ogata mentioned the voice recording is still ahead of them. She said how "the beginning of the end" is an appropriate term. (I swear Mitsuishi's rockin' a Sailormoon purse there, unless my eyes are just that bad.) She wants everyone to enjoy it, but to please wait. That's certainly exciting news! Do they do voice work before or after animation? I know a lot of anime studios don't do it the way western studios do but I can never remember which way that works. BlueBasilisk wrote: Do they do voice work before or after animation? After, and Ogata said that "recording is ahead". The tweets reference 打ち入り (uchi-iri), which is an anime industry term for an informal social gathering held to mark the beginning of voice recording work. (Props to this page for explaining it.) The latter is called "afureco" ("after-recording"), and is the same word used in Japanese for what we call ADR and dubbing, though in the case of anime it seems almost a misnomer; the film can still be in a very rough state when it happens.